You can beg for more all you like, but this is IT, hon. 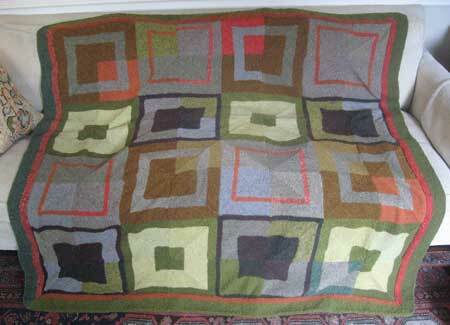 This is the very last time you’ll ever get to see pix of the Tweedy Squares blanket, because the fact is . . .
It’s done. Four corners, neat and, um, kind of rounded because of all the corner decreases and curled edges and whatEVer. This corner is a freaky little collision of yarns. How long did the border take to make? Using my preferred unit of measure, the O’Brian (1 O’Brian = one audio version of a Patrick O’Brian novel) it took 13 hours of The Ionian Mission (86% of the book) plus 3 hours of Treason’s Harbour (25% of the book). So: about 1.1 O’Brians to make an 18′-long, 3″-wide garter stitch blanket border. Here’s the thing: I have never been bored during the making of this blanket, which is the largest thing I’ve ever knitted. It’s kind of mysterious, actually, but I think it has to do with the bite-size squares, using all the yarns which have been like pets to me, and cooking up the design myself. I really wanted to show you this blanket with its new owner, David. Ever since I renewed my work on this project, he has been consulting with me on color choices; the juniper green is completely a David recommendation. But this morning I took the fella to school early for the sixth grade whitewater rafting trip in West Virginia, so I’m rattling around the house wondering about the guy. He’ll be gone for four days. So please pretend that this chair is David: a large-eyed, 11-year-old boy. What in the world am I going to do with myself now? The blanket is gorgeous! Everything about it looks just perfect. It looks great! I love the symmetrical randomness of it. Can’t wait for your next book. Please come to Southern California when you promote it! from a frequent reader, infrequent commenter. The FO is great!!! It came out beautifully. “symmetrical randomness” what a great way to describe it. Love it. David’s a lucky boy. Stunning subtle colours & cubes. Quite wonderful. I LOVE this blanket. I also love that you didn’t flake out on it. It gives me courage to try something similar and believe I could get through it, albeit with Jane Austin or PG Wodehouse as companions ;-). The blanket is just beautiful. David is a lucky boy. My kids are lucky if I manage to knit a pair of mitten or socks for them. The blanket came out great. If you need a new project you can help me knit Christmas presents. LOVE IT – love how well it complements the couch and the chair as young men are known to leave such items in such places! It is fabulous! 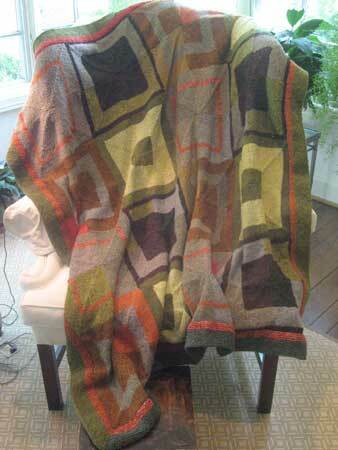 Tell David that he has a very good eye for color and I want, no I covet his blanket very much! Hope he has a blast! It’s perfect. A piece of art, really. Love the blanket. My boys have been asking for one. I really love the Mike Mulligan reference. As a mom of little ones…we’ve been reading that a bunch. But, I’ve always loved that book…I remember my mom reading it to me. And she remembers her mom reading it to her. So, if this made you feel like Mary Anne and Mike Mulligan, then your next big project should make you feel like The Little House (Virginia Lee Burton as well). We’ve been reading that one this week (we’re in the stage when I read a book…they say AGAIN) Do you know that one too? wow wow wow — it’s gorgeous!! I love the squares, I love the tweed, but most of all (surprising myself here) I LOVE the orange border flanked by the green. It’s wonderful Ann – what’s next on the blanket roster? Definitely it grows on one…like lichen. Oh, come on! It’s really beautiful. I like to think of it in contrast to Belinda’s all denim that shimmered like the bottom of a pool (cain’t find it in the archives) or Kay’s for the book that pops. Yours winks knowingly. Lucky David! That is one beautiful blanket! As for what to do next? Knit something else is always a good option. And that doesn’t account for the picked up stitches, the bound off stitches, the increased number of stitches at the corners, the fudging, etc. (I never claimed to be a rocket surgeon). It’s back to school week, right? That blanket is a work of art and will be a family heirloom one day. Kudos to you. Oh, what a work of art this blanket is. It’s just beautiful. Congratulations on everything from the design (amazing) to execution (perfect)and for having the the stick-to-it-iveness to complete it! Wow! I am so impressed. Can’t wait to see what you do next. Forgot to add the square footage calculation. Using your 18′ of 3″ border calculation, it’s 4.5 square feet of border. That’s 4.1 square feet [K all] [DK] per O’Brian. To knit a 1,200 square foot ranch house, you would need approximately 267 O’Brians. But that’s without accounting for increased speed over time. Or sanity. Clearly lacking on my end today. Let me know if you’re interested in an Excel sheet that would recalculate according to different variables. I think it would take me less than .1 O’Brians. Oh, Ann. It is just lovely. I think you loved it because it was for David AND because it was made of such yummy tweedy Rowan. As David gets older, you will find yourself waiting to hear him ask you to make him something. There is no greater thrill than knitting for one’s children, no matter the age. Wow, it’s so beautiful! I just LOVE it. Congratulations on finishing it!! Words fail, Ann, because I am in awe. Stupendous! The couch and blankie shot is saying “nap time” to me. Great job! You sent yours rafting! Now I feel better about letting my 12-going-on-13 year old walk to school by himself today. (Hey. We live in a big city.) Now that he’s literally as big as I am, I realized I have to stop pretending that I somehow serve as his bodyguard. David will be thrilled to come home to his new blanket. It looks great. David is quite a lucky-cool guy! First, he has a sense of color. Second, he is the recipient of one great love-it-forever blanket. Third, whitewater rafting in West Virginia is awesome this time of year (check out the new WV quarter- if he is rafting the New River he will go right under the bridge depicted on it!). Try not to worry too much- he’ll be back before you know it. Eeeeeeeee! Am a very keen fan of Mike and Mary-Ann! In fact, I just bought the board book version for my tiny niece, because 17 months is plenty old enough to learn that a cheering section helps you go a little bit faster and a little bit better through a tough project. 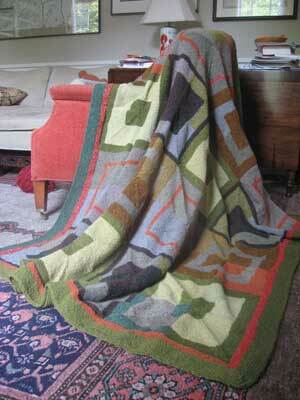 Blanket is llllllovely…I’ve got a real yen to make something big and square, and I think you’re the influence! Way cool! I finished my sock yarn log cabin over the weekend, too. Yep. Sock yarn log cabin blanket. Used up all the bits of sock yarn that were left over after knitting a pair of socks. Love it. I know what you mean about not knowing what to do with yourself after a big project. I just finished the Moderne Log Cabin afghan from your book, which has been my primary project since last October, and feeling somewhat at loose ends about what to do next. At the moment, I’m finishing some long-cast-aside projects. The blanket is lovely! 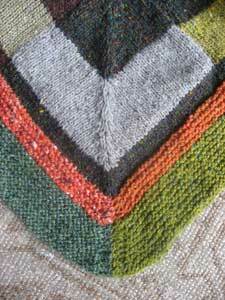 I love the colors, the geometrical design, and of course, the border. Time to knit something for yourself! It’s just gorgeous and warm and lovey looking! What a great blanket! That’s a seriously great blanket. I sent my 6 year old boy off to his first day of Grade One this morning. He had a great day. I’m still reeling from the shock, and quite frankly, injustice that my baby is already big enough to be in grade one. He’d like that blanket too. That is a very beautiful blanket. I love it. You can always come by and see your neighbor. It’s gorgeous! Fab. Fab. Fab. It is BEAUTIFUL!!! I am so impressed by your stick-to-it-ness. I don’t think I could do anything that large at this stage in life. 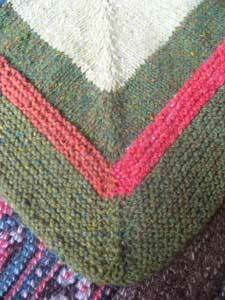 There is a scarf on the Interweave blog that resembles your blanket. It’s a beauty, but don’t know if I could do that either. Maybe for a throw for my living room sofa, since I live in Florida and have no need for a scarf. You continue to amaze me with your projects. I love reading the blog and look forward to your new book. The blanket is AMAZING! Congratulations on such a beautiful job! Of course I love the blanket, but I really love the fact that you worked Mike Mulligan and Mary Anne into the mix! That is one fantastic looking blanket! I love its tweediness. You’ve got me thinking about actually knitting a blanket… but I know that would probably just end up with me having about 12 mitred ‘potholders’! Soooo… Since this was your biggest project EVah, when it is wrapped around your son, the result will be…. The blanket is just lovely and what a treasure for your son. I hope you stare at it often during the day. What an accomplishment! We ADORE Mike Mulligan in this house! Your blanket is beautiful. How do you feel about Katy? The blanket is beautiful! Have you seen Knitting Daily’s log cabin style scarf/shawl? When I saw it, I thought of you. Could be your next project. You are amazing, I think that is my favorite of your recent project. Just Loverly! It looks FABULOUS Ann ! I’m awed, not only by the hugeness and loveliness of all that tweed–but also by the depth of your stash. That’s a lot of tweed. I knew that Kay had this thing for the denim, but I did not realize it was matched only by your acquisition of tweed yarn. This is a thing of beauty, I wish I could afford enough Rowan Tweed to make something similar. My name is Stelics Xia from China. with best price in High quality. products catalogue, Please tell me if I can do any assistance for you! Hope we will have a new cooperation in a near future! Hangzhou Junseen Fashion Co., Ltd.
Wow, the afghan is gorgeous. I like the optical effect of changing to a lighter color in one of the angles; it almost looks like we’re studying something transparent. One very nice blanket! Hope it keeps Daivd warm on cold nights.